The offseason tradition continues. Today I proudly bring you, dear readers, the first installment of SDPI. For those new to the site, SDPI is my own personal rating system, stolen from Eddie Epstein, that I use to evaluate teams in each of the nation's 11 IA conferences. We'll begin, as always, with the BCS conferences and tackle those alphabetically before moving on to the so-called mid-majors. Without further adieu, here is the 2010 incarnation of the ACC in SDPI form. If you're interested, here's the link to last year's ACC article. As usual, this first paragraph will explain how SDPI is calculated. So if you want the meat of this article skip on down. In the 2010 ACC regular season, conference play only, championship games excluded, the average ACC team gained and allowed 2963.583 yards. The standard deviation for yards gained (offense) was 424.06 yards. The standard deviation for yards allowed (defense) was 406.36 yards. Maryland gained 2831 yards and allowed 2726 yards. Their offensive SDPI was -0.31 = [(2831-2963.583)/424.06]. Their defensive SDPI was 0.58 = [(2963.583-2726)/406.36]. Their total SDPI was 0.27. This number ranked 7th in the ACC. 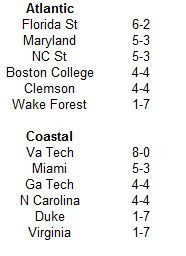 Here are the 2010 ACC standings. Now here are the 2010 ACC SDPI standings. The standings are sorted by division by total SDPI with ranking for each category (out of 12 teams) in parentheses. 2010 was a somewhat historic year for the ACC. For the first time since 2000, the ACC champion managed to navigate through the conference season without a loss. However, unfortunately for the reputation of the league, its champion also lost a non-conference game to James Madison. For the ACC Champion Virginia Tech Hokies, 2010 marked the first undefeated league campaign since their Michael Vick-led siege of the Big East in 1999. According to SDPI, Miami was the league's best team by a significant margin. However, the Hurricanes lost at home to the two teams that played in the ACC Championship Game, and for good measure, decided to give Virginia their only league win. Why did Miami fair so poorly (relatively) despite glistening SDPI numbers? Turnovers, plain and simple. While their turnover margin was not terrible, their volume of turnovers was. Miami matched Duke with 22 turnovers in 8 conference games. Quarterbacks Jacory Harris and Stephen Morris played fast and loose with the football, throwing 12 interceptions in ACC play between them. However, what was especially damaging to the Hurricanes chances was that the turnovers came in bunches. In two of their league losses, to Virginia and Virginia Tech, the Hurricanes committed 11 turnovers (half of their league-leading total). That promiscuity with the pigskin is what cost Randy Shannon his job (the Hurricanes added 7 more turnovers in non-conference losses to Ohio State and South Florida) and is something new coach Al Golden will need to correct if he is to take Miami to their first ever ACC Championship Game. Scroll back up and look at that turnover margin table. I'll give you a minute. Virginia Tech was an amazing +17 in turnovers in ACC play with just 6 turnovers committed! That's how you go undefeated despite solid, but unspectacular SDPI numbers. But that's Beamer Ball right? Virginia Tech always has ridiculous turnover margins. 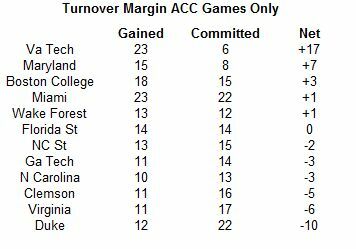 While the Hokies are usually rank near the top of the ACC in turnover margin, that +17 number from 2010 appears to be a bit of an outlier. While the Hokies boasted a comparably fantastic margin in 2007, it shrunk from outstanding, to merely good in 2008. I would expect a similar result in 2011. When they weren't turning the ball over, the Hurricanes were moving the ball with relative ease. Their lowest yardage output came in the conference opener against Clemson when they managed only 376 yards. If they had only averaged that number all season, they would have still ranked 8th in the conference. After bidding adieu to one of the school's best quarterbacks in Riley Skinner, the Deacons struggled profoundly moving the ball in 2010. After opening conference play with 54 points in a win over Duke, the Deacons would manage just 55 total points in their next four conference games. The Tigers continued their run of outstanding play on the defensive side of the ball in 2010. 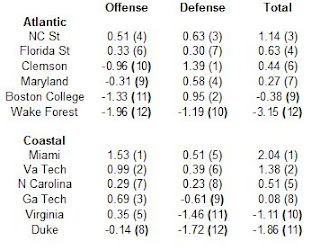 Clemson has ranked either first or second in the ACC in defense each of the past five seasons. Outside of 2009, when they somehow ranked 8th, the Blue Devils have been either last or second-to-last in the ACC in defense every year since 2005. It was under-reported, at least by most of the college football media, but I found it interesting that both 2009 ACC Championship Game participants (Clemson and Georgia Tech) stumbled in 2010. Both posted losing overall records for the first time since 1998 (Clemson) and 1996 (Georgia Tech) respectively. Both slipped thanks to just one side of the ball. For Georgia Tech, it was their defense, which became a sieve. Their potent triple option offense was strong, but unable to compensate for their defensive shortcomings. For Clemson, it was their offense, which crumbled, and wasted the best defense in the ACC. Clemson's fall can be attributed to perhaps the most important aspect of modern football, the forward pass. Quarterback Kyle Parker deferred a few million dollars in order to return to Clemson, and he hoped, bring an ACC title to Death Valley. Unfortunately, Parker regressed in his return, and the Tigers could never realistically entertain thoughts of an ACC championship. Parker's completion percentage declined a little, but the significant declines came in his yards per attempt and touchdowns. Without a big play receiver (like Jacoby Ford or CJ Spiller), Clemson was unable to generate big plays in the passing game. They also had a very tough time scoring. The Tigers were anemic moving the football (as seen in their SDPI numbers), and they were equally inept scoring touchdowns. Their 16 total touchdowns in eight league games tied for second fewest in the conference with Wake Forest. 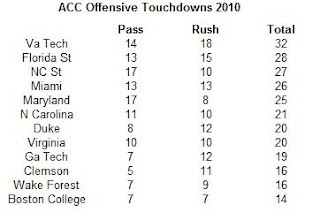 Plus, the Tigers had by far the fewest passing touchdowns. Even the woeful passing attacks at Wake Forest and Boston College had more, as did the team that ran the ball on virtually every snap (Georgia Tech). Of course, all the blame should not fall at the feet of Kyle Parker. The Tigers top quartet of receivers in 2010 (DeAndre Hopkins, Jaron Brown, Dwayne Allen, and Jamie Harper), had a combined 28 receptions heading into 2010. All four return in 2011, so even without Kyle Parker, the Clemson offense has a good chance of improving even as they must break in a signal caller. While writing the Big 12 Compendium a few weeks ago, I was curious to find out how homefield advantage manifested itself in each conference. Since the conference landscape will profoundly shift in the fall of 2011 with, among other things, the Pac-10 adding two teams, the Big 12 losing two teams, and the Big 10 gaining one team, I decided to look back and analyze homefield advantage since the last seismic conference shift prior to the 2005 season. Since the beginning of the 2005 season, there have only been two minor alterations in conference alignment, with both occurring at the mid-major level. Temple joined the MAC in 2007 and Western Kentucky joined the Sun Belt in 2009 (they technically played an abbreviated league slate in 2008, but since they only played five of the other eight teams, I am disregarding that). Otherwise, each conference has been stable for the past six seasons. 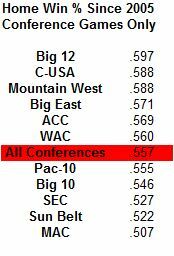 With that out of the way, here is the cumulative home record for each conference since 2005 (includes conference games only). The Big 12 has enjoyed the most significant homefield advantage with its member schools winning roughly 60% of the time at home in league play. Homefield has mattered the least in the MAC with the home team winning just barely more than half the time in league play. In the aggregate, the home team has won on average about 56% of the time in conference play since 2005 (the All Conferences number). The bigger question I wanted to answer when examining homefield advantage was which teams showed the biggest difference in their home and road performance. This analysis did not consider neutral site games, so the annual clashes such as Florida/Georgia in Jacksonville and Oklahoma/Texas in Dallas as well as any other neutral conference game were not included. 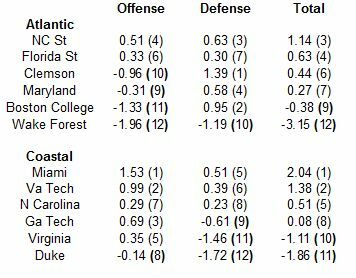 So which teams had the largest difference in their home versus road conference winning percentage? The number one team will certainly surprise you. The Red Wolves from Arkansas State are one of the more formidable home teams in the country when facing their conference brethren. They are second to Troy in overall home record in Sun Belt play, sporting a 17-5 mark since 2005. However, away from Jonesboro, the Red Wolves are much more tame, posting just a 6-16 mark in Sun Belt road games. 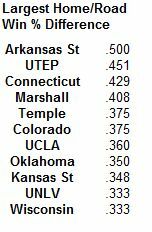 That is the worst road record among Sun Belt schools that have been members since 2005. Only Western Kentucky has been (slightly) worse on the road, with two wins in eight road games since coming aboard in 2009. While UTEP has been solid at home in Conference USA (their 15-9 mark is tied for fifth best), they have been the second worst road team, winning just four times in 23 games. Marshall has also struggled on the road in Conference USA. They have the same home mark as UTEP, and are just one game better on the road (5-18). In the Big East, Connecticut has the second best home record at 14-7, but is tied with Syracuse for the worst road mark at 5-16. In the MAC, Temple has dominated their conference opponents at home, going a league best 13-3 at Lincoln Financial Field. By contrast, the other ornithological tenants of the Linc (the Philadelphia Eagles) are just 10-6 in their last 16 home games. The Owls are more nocturnal on the road, posting just a 7-9 mark since joining the MAC. Three Big 12 teams are bunched rather closely together on this list. Colorado is decent at home (13-11), but just 4-20 on the road, including just 2-18 under the recently recently fired Dan Hawkins. The Buffs have lost 13 straight Big 12 road games, with their last win coming against Texas Tech in October of 2007. Oklahoma is a little difference case, as they are unbeaten in Norman (21-0), but a more human 13-7 on the road. Like Colorado, Kansas State has been respectable at home (12-11), but putrid on the road (4-19). Out west, the Bruins from UCLA have posted a solid home mark (17-10), including four wins over top-10 teams (Cal twice, Oregon, and Southern Cal), but are just 7-19 away from the Rose Bowl. UNLV has not been very good in any venue, but they have managed nine home conference wins since 2005. Away from Sin City, the Rebels have won just once since in 24 league games. Wisconsin is second only to Ohio State in terms of home Big 10 record (20-4). However, on the road the Badgers are just 12-12. While Jonesboro, Arkansas may not be the most difficult place to win (I would say Boise, Norman, Fort Worth, or Columbus are the most arduous venues for visitors) it has conferred a significant advantage to Arkansas State when compared to the team's road performance.